Up to a million gladiators are thought to have died in arenas across the Roman Empire. And, apart from ancient Italy itself, Roman Britain had the highest density of purpose-built gladiatorial arenas in Europe. Interest in gladiators has been at an all-time high since Russell Crowe's sword and sandals epic. But the details of the lives and deaths of gladiators remain fragmentary. 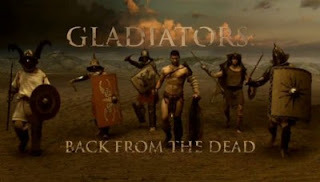 Now, featuring sensational new archaeological discoveries, Gladiators: Back from the Dead vividly recreates the world of the Roman arena and how six gladiators lived, fought and died. The programme reveals how the various types of gladiator were trained in special schools, including Retiarii, who fought with nets and tridents, heavyweight Myrmillonis sword fighters, Thracians armed with special 'bent' swords, Secutors (literarily pursuers) who wore special helmets, and the Bestiarii, who fought wild animals. The programme follows archaeologists and forensic anthropologists as they analyse dozens of Roman skeletons found in Britain over recent years: individuals who evidence shows came from across the Roman Empire. And, using injuries found on the bones, including weapon cut marks and even large carnivore bite marks, as well as evidence of heavy training, the programme re-creates ancient gladiatorial life and death.